Click here for a photo slideshow of the new ﻿construction. After cramming what managers called “six months of work” into 18 weeks, the newly renovated Johnson & Hardwick cafeteria is ready for business. The Louis J. Esposito dining court will operate full service beginning this afternoon, general manager David Tolbert said. Food stations are placed throughout the larger, new space. A permanent vegetarian and vegan display is the first station diners see upon entering, and it will be equipped with a daily vegetarian cooking display. As the semester gets underway, Tolbert said new menu options under the Balanced Way program will begin to help students get healthy if they so choose. The program is being driven by a group of professors from Drexel University and Sodexo. “There’s way more that we can offer than we could before,” Tolbert said, emphasizing that students had previously expressed a desire for healthier fare through comment cards. Old favorites such as the deli station, fast food station and salad bar have been revamped but will still be offering student favorites. In order to meet the most recent Philadelphia health codes, the deli and fast food stations will no longer be self-service. Sandwiches will be made to order and hot dogs and hamburgers will be preassembled for students. Tolbert said the salad bar will now be double-sided so lines won’t be as long. To deal with flow issues, three beverage stations are spaced throughout the dining area. The popular “sizzling salad” station has been expanded and is a permanent fixture to the dinner menu. The wrap station has also been expanded to include two extra sandwich choices and an extra salad option. Returning students will hardly recognize the space, which has greatly increased its seating capacity from 454 to 708 seats. A building expansion of 20 feet increased seating capabilities. The dining area has booths and tables that can accommodate groups of varying sizes. “We lost that old grade-school seating where all of the tables were lined up and the same size,” Tolbert said. Hoping to throw away as little as possible, management gathered the old tables that were in the best condition and sent them to the Ambler Campus and the Diamond Club in Mitten Hall. Tables and chairs were also donated to local churches. “We tried not to throw anything away that people could use,” Tolbert said. 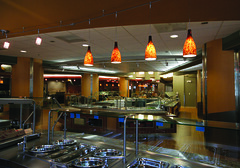 The Valaida S. Walker Food Court in the Student Center acted as a pseudo-J&H during the summer months. “It was an awkward setup because we were doing resident dining in a place that wasn’t built for it,” Tolbert said. The last upgrade to the J&H cafeteria occurred while school was in session in 1993. Over more than eight months, construction crews worked to complete renovations. New laminate flooring and carpet complete the modern look of J&H. Instead of one main walkway in the dining area, the laminate flooring is shaped into paths leading to all seating areas. All paths lead to the tray return, which now has sound barriers so the noise of clanging dishes no longer resonates throughout the dining hall. “It’s like following the Yellow Brick Road in and out of the dining room,” Tolbert said. LeAnne Matlach and Chris Stover can be reached at news@temple-news.com.